BETHLEHEM -- The Moravian College football team broke open a 13-7 game at the half with 21 unanswered second-half points as the Greyhounds posted a 33-14 victory over King's College in the season-opener for both teams at Rocco Calvo Field Saturday in Bethlehem. "It is critical to get the opening win and we're excited to win in week one." said Moravian's head coach Jeff Pukszyn. Tyler Hartranft hit Dan Kempa for 14 yards to Moravian 38.But the drive would stall and on fourth-and-four from the Greyhound 34 Robinson picked up three yards on a swing pass but was stopped a yard short of a first down. After King's assumed possession at its own 20 following a Moravian punt, the Monarchs were again unable to move the ball. On fourth down King's special teams delivered a first down on a fake punt after a short snap to Patrick Robinson, who gained 25 yards to the Moravian 36. But on the next play a Tyler Hartranft pass was batted into the air at the line of scrimmage and picked off by Moravian's Kevin Bracken at the Greyhound 31. Late rin the first half Moravian took over at its own 28 following a King's punt. The Greyhounds marched 72-yards on 11 plays, capped by an 11-yard scoring dash by Negron. The extra-point was good as Moravian built a 13-0 lead with 2:26 left in the half. King's Justin Burke took the ensuing kickoff 56 yards to set the Monarchs up at the Moravian 37. Hartranft hit Tyler Marroni for 14 yards to the Greyhound 13. Two plays later a six-yard pass to Marroni to set up a third-and-six play from the six. An incomplete pass, however, would force King's to bring in the field goal team. But the Monarchs ran a fake with holder Tom Hehre scoring just inside the right pylon. Mikhail Kniaziewicz made good on the point after top bring the Monarchs to within 13-7 with 1:11 left in the second quarter, a score which hold up at the half. King's offense mustered just 137 yards on 30 plays in the first half. After King's was forced to punt to start the second half Moravian responded with a eight-play, 56-yard drive that ended with Mike Hayes tossing a five-yard touchdown pass to Will McGlaughlin 10:09 as Moravian extended its lead to 20-7 lead 10:09 left in third. After another King's punt the Greyhounds used 10 plays to march 75 yards, capped by a 14-yard scoring strike from Hayes to Liam Nolan to push the score to 26-7 lead with 4:44 on the clock. King's had a chance to answer on the ensuing kickoff as the Monarchs drove 45 yards but failed to capitalize when a 22-yard field goal attempt sailed wide. After forcing a Moravian punt King's marched to the Moravian 36 but again failed to capitalize when fourth-down quarterback sneak was stuffed at the line. Moravian then put the game away early in the fourth quarter when freshman receiver Eli Redmond scored on a 66-yard run with 10:21 to play to give the Greyhounds a 33-7 lead with 10:21 left in the contest. King's scored the final points of the game when Hartranft hit Kempa with a 33-yard touchdown pass to cap a nine-play, 66-yard touchdown drive to trim the lead to 33-14 with 6:44 on the clock. 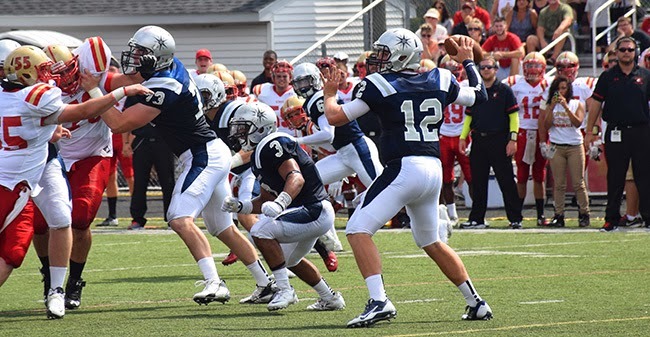 Moravian outgained King's 440-to-352 in total yards and posted 23 first downs compared to 19 for the Monarchs. The Greyhounds ran for 243 yards while holding the Monarchs to 144 on 31 attempts. Patrick Robinson led King's runners with 77 yards on eight carries while Kyle McGrath was held to 18 yards on eight attempts. Hartranft completed 16-of-34 passes for 195 yards with one touchdown and three interceptions. Robinson also had a team-high six catches out of the backfield for 38 yards. Kempa caught five passes for 65 yards and one score while Tyler Marroni and Jay Thomascaught three and two passes respectively. For Moravian, Negron finished with 100 yards on 18 attempts while Redmond added 71. Hayes completed 15-of-29 passes for 197 yards and two scores. Nolan caught six passes for 92 yards and a touchdown while McLaughlin also added six for 59 yards. King's makes its home opener next week when the Monarchs host Stevenson University at McCarthy Stadium.